Same as their other Casino "Q" on the west side of Yuma. Packed in just the same in straight lines one after the other. No table games here only slots - very smoky - looks like they're trying to remodel a bit. Bad - unkept city roads getting here. Pass on by -- Plenty of Free BLM land all around Yuma -- Lake Mittry on NE side and Sidewinder Rd and Ogliby Rd. on the west. 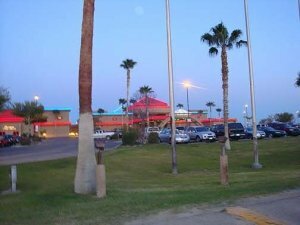 Then drive in to gamble / shop / visit Algodones.